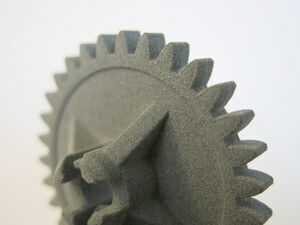 Multi Jet Fusion is an additive manufacturing method invented and developed by the company Hewlett-Packard (HP). It creates parts additively thanks to a multi-agent printing process. In this process a fusing agent is applied on a material layer where the particles are destined to fuse together. Then a detailing agent is applied to modifiy fusing and create fine detail and smooth surfaces. To finish, the area is exposed to energy that will lead reactions between the agents and the material to create the part. When the printing process is complete, the build box is removed from the printer. A n operator carefully extracts the parts from the build box and removes the remaining powder thanks to brushes and air blowers. At Sculpteo we are using the HP Multi Jet Fusion 3D 4200 printer to 3D print your part in Multijet Fusion PA12. The machine has a maximum building size of 380 X 284 X 380 mm for raw printing. The Multi Jet Fusion process is the fastest plastic 3D printing technology. In comparison to FDM or SLS technologies, HP Multi Jet Fusion can 3D print up to 10x faster. Thanks to this speed you can receive your parts quickly. It's the perfect choice for prototyping or manufacturing. Multi Jet Fusion can create complicated and highly detailed design in a very short amount of time. Jet Fusion plastic is great for both beginning designers and experienced professionals because of its high precision and low cost. The main benefits of the Multi Jet Fusion technology is the high customization possibilities and the fast production time. Also, another benefit is the fact that our non-dyed MultiJet material, is a low-priced material and a great economical choice. 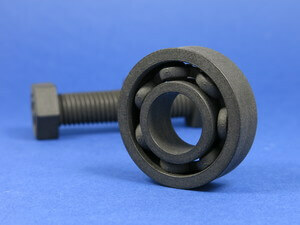 This material is ideal for prototyping and mechanical tests. Thanks to our online Multi Jet Fusion service, you can have access to professionnal Multi Jet Fusion 3D printers to produce your part, distantly, and without needing to worry about operating the machines. You'll get your 3D printed Multijet Fusion PA12 parts, fully functional and ready to be used or integrated into a larger object, within a few days. With our online Multi Jet Fusion service, you can 3D print in Multijet Fusion PA12. PA12 used is a strong thermoplastic which is able to produce high quality parts. To learn more about the other plastic 3D printing techniques, visit our materials pages. 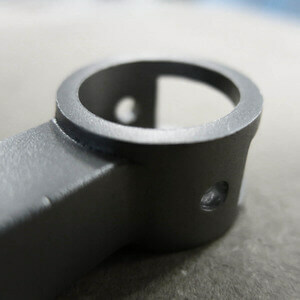 Multi Jet Fusion manufacturing technique is particularly useful to create unique plastic parts with a good surface finish. With such a technology, you can create very complex shapes in a very short amount of time. Thanks to this technology you can reduce costs and improve performance.